← Do you know Menu Key?? If you are a fan of Autofilter AND a hater of mouse, you will love this trick. Give it a try! You will see the beauty of Menu Key. Just one drawback: actions performed by Menu key cannot be “undo”. Before you read this post, what is the last time you pressed the Menu Key (intentionally)? This entry was posted in Excel Tips, Shortcut and tagged Auto Filter, Keyboard Shortcut, Menu Key. Bookmark the permalink. your tip doesn’t work in MS 2003 Professional. The Menu Key only opens the Kontext Menu and doesn’t work with shortcuts. On one site is mentioned that you can create your own shortcuts in Excel. I’ve got that feature in Word but neither in Excel nor in Outlook. Yes you are right. 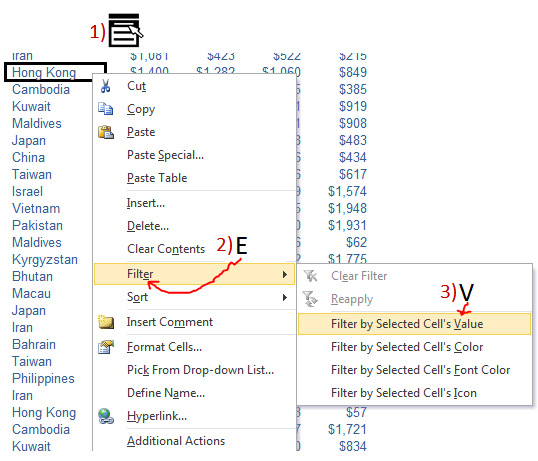 That doesn’t work for Excel 2003 because the right-click menu does not include “Filter” in Excel 2003. If I remember it correctly, it was not until Excel 2007. Therefore this menu shortcut won’t work for Excel 2003 or before.